The Zimányi Medal was founded in 2011 by KFKI Research Institute for Particle and Nuclear Physics in memory of Professor József Zimányi (1931-2006), member of the Hungarian Academy of Sciences, an internationally recognized nuclear theorist. The medal commemorates his scientific legacy in theoretical nuclear physics, where he was a leader in the field of high energy nuclear theory and in the search for the quark-gluon plasma. The Zimányi Medal in Nuclear Theory is granted to a young theoretical physicist under 40, who made extraordinary contribution to the field of high energy nuclear physics. The candidates should have a well documented record of accomplishment through published papers and international recognition to be nominated. The nomination was made by members of an international committee chaired by Professor Miklós Gyulassy (Columbia University, New York), external member of the Hungarian Academy of Sciences, scientific advisor of KFKI Research Institute for Particle and Nuclear Physics. The „Zimányi Medal on Nuclear Theory” was created by the well-known sculptor Imre Varga. 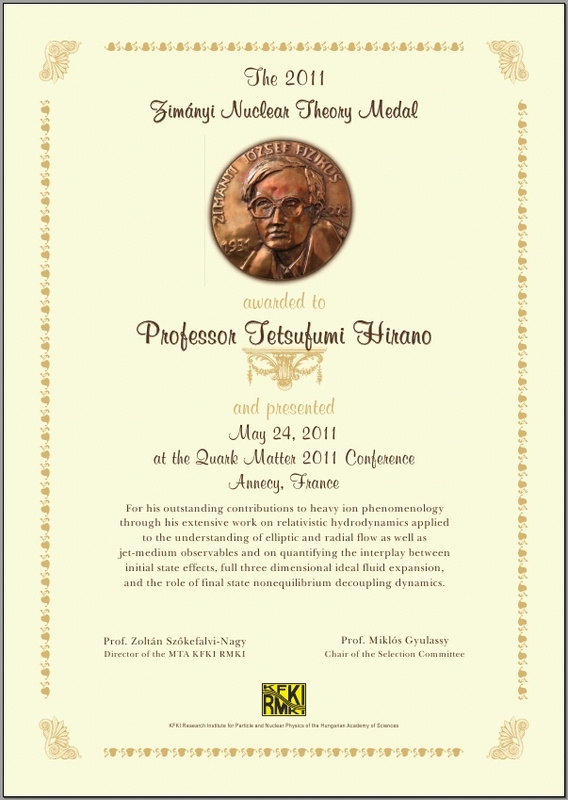 The 2011 Zimányi Medal was awarded to Tetsufumi Hirano associate professor of Sophia University, Japan for his outstanding contributions to heavy ion phenomenology through his extensive work on relativistic hydrodynamics applied to the understanding of elliptic and radial flow as well as jet-medium observables, and on quantifying the interplay between initial state effects, full three dimensional ideal fluid expansion, and the role of final state nonequilibrium decoupling dynamics. Thanks to a donation a cash prize was also given together with the Medal.